Incumbent PNG LNG Kumuls coach Michael Marum has been confirmed to guide the national rugby league team into the 2017 Rugby League World Cup. PNG Rugby Football League chairman Sandis Tsaka said his Board ratified the appointment of Marum as PNG LNG Kumuls coach at its meeting last week. He said Marum’s appointment was confirmed following the PNG LNG Kumul’s win over Fiji in the Pacific Test in Sydney in May. “The win has taken PNG to 11th spot in world rankings from 14th spot and proves he is the right person to start preparing the national team for the World Cup next year,” Tsaka said. He said Marum’s appointment becomes effective immediately and will run until October 31, 2018. “I am happy the Board have confirmed my appointment and I will start preparations for this important event,” Marum said. “I thank the PNGRFL Board for their continued confidence in me to guide the PNG LNG Kumuls into the World Cup next year. “With three games to be played in the country, it will be a big challenge but we will prepare as best as possible starting now to perform well at home,” Marum said. He said those players currently playing in the Australian NRL, English Super League, NSW and Queensland Intrust Super Cup competitions will be closely monitored. 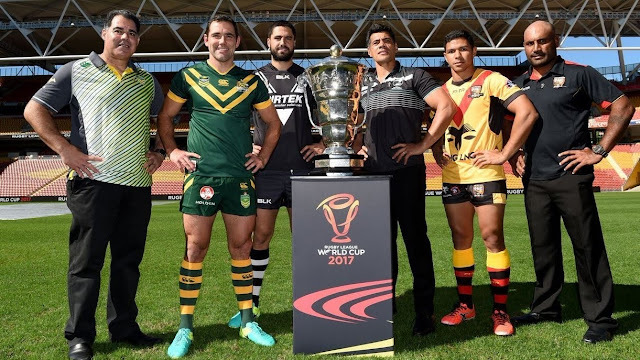 Marum’s first engagement was a fortnight ago when he attended the announcement of the World Cup draws in Brisbane with PNG LNG Kumul captain David Mead alongside Australia’s coach Mal Meninga and captain Cameron Smith and New Zealand coach Stephen Kearney and skipper Jesse Bromwich. The RLWC2017 will see 14 nations play 28 games over five weeks in PNG, Australia and New Zealand from October 27 to December 2, 2017. All countries taking part will be hoping to be crowned world champions in what is the pinnacle event in international rugby league. Meanwhile, Tsaka also announced the extension of Marum’s coaching tenure with the PNG Hunters until the end of the 2018 season. Tsaka said the contract was due to expire at the end of this season. “I’m happy to announce that Michael has agreed to continue his role as coach of the Hunters until October 31, 2018,” Tsaka said. Marum said he was happy his future has been cleared and will focus his energies into guiding the Hunters go a step further this year in the Intrust Super Cup competition. “That’s our goal and I guess it’s everybody’s expectation, but we will do as best as we can hoping there are no major injuries or loss of form by the players to achieve this dream,” the respected coach said. The Hunters entered the Queensland Intrust Super Cup competition in 2014 with Marum as coach. In that first year, the Hunters missed out in the top five by a point. Last year, the Hunters finished second after the season proper, but were beaten by eventual premiers Ipswich Jets in the preliminary final. Chairman Tsaka said Marum will build a good team of people around both the Hunters and Kumuls to deliver both programs successfully. He added that having learnt from the experience of the past few seasons. “We are better placed to deliver both programs successfully,” he said.